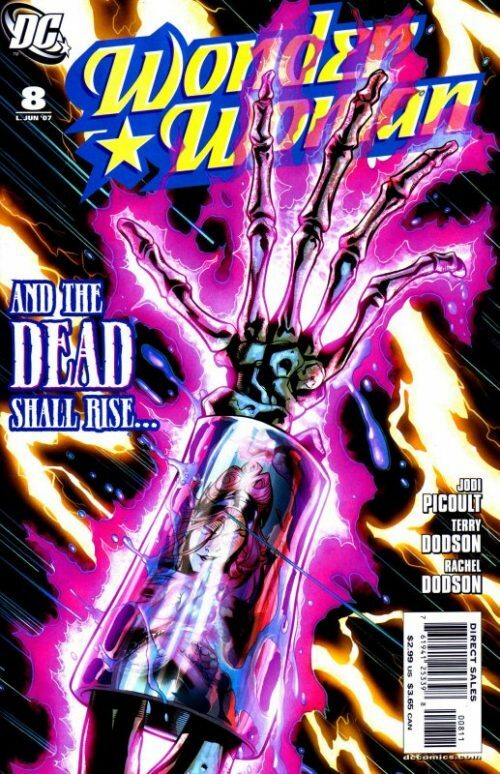 In this issue we continue to see Picoult further develop the “love hate” sexual chemistry between Wonder Woman and Tom Tresser, as well as expanding upon the issues that Diana has been wrestling with since her slaying of Maxwell Lord. In particular, there is an insightful exchange between the Amazon and Circe about what it means to be human and what constitutes right and wrong. In the world of comics it is true to say that nobody that dies is ever truly dead. Over the course of history characters who have been thought long gone and never to return find ways to literally come back from the dead. 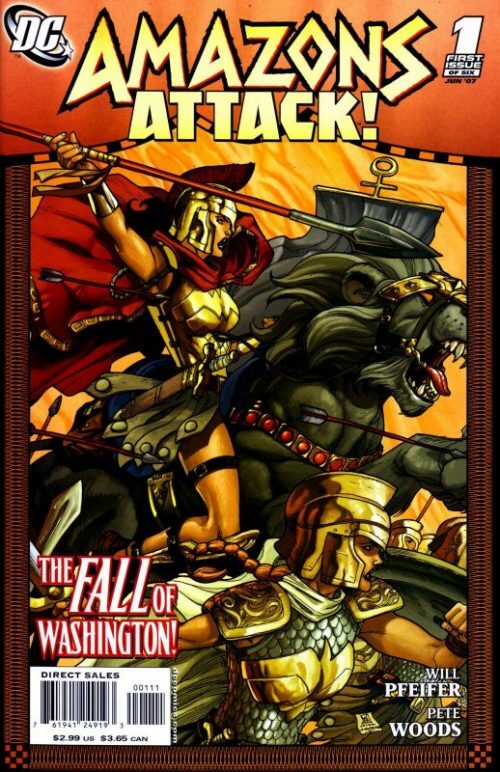 After the debacle of the “Our Worlds At War” crossover event that saw Hippolyta give her life to save Athens, fans had always bemoaned how the Queen’s death had been totally unnecessary, simply done to add some shock value to what turned out to be an otherwise misguided and clumsy story line. They also saw this as another example of DC’s contempt for Diana and her history, asking why it was that Superman’s parents managed to survive the conflagration and yet Diana had to lose her mother? Since then there had always been rumours and rumblings of her possible return and so it was perhaps inevitable that the valiant Queen would finally make her triumphant return. However, the circumstances of her return perhaps implied that it might not be a permanent reappearance, seemingly contrived only to facilitate the “Amazons Attack” crossover story that begins in the same month. 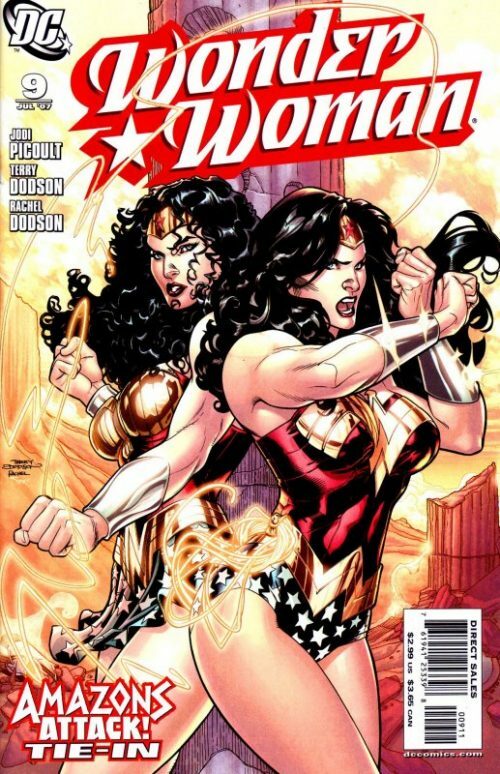 Back on Themyscira the Amazons are overjoyed to see the return of their beloved Queen. They ask why Circe would do such a thing and she tells them that the enemy of her enemy is her friend. 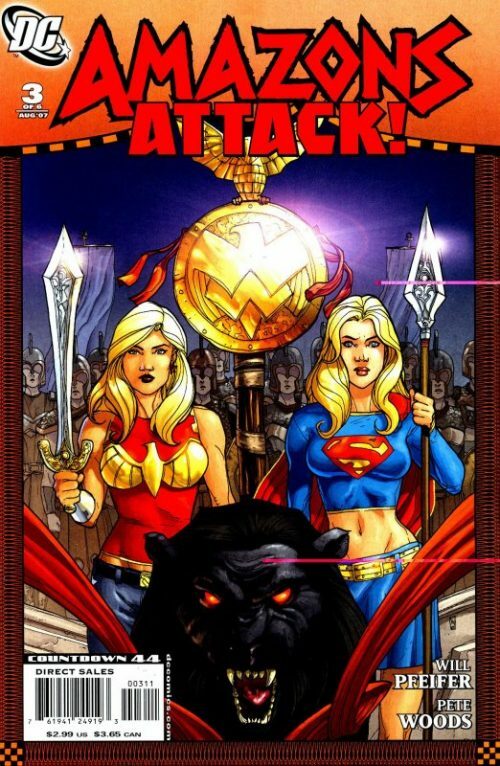 She then conjures up an images showing Diana in her cell and tells the Amazons that both she and the rest of the Amazons are in grave danger. 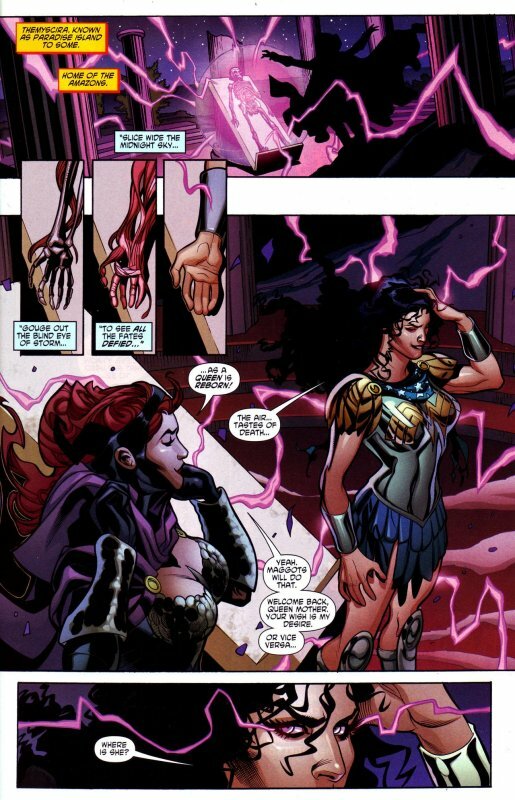 An enraged Hippolyta, who it is hinted at as actually being still under the spell and control of Circe, states that it is always the same with World of Man. What they do not understand they fear…and what they fear they try to tame. To them her daughter has become the enemy and enemies must be crushed. “If it is war they want…then war is what they’ll get!”. Meanwhile at the Vixen’s Bar, Tom Tresser is trying to phone Diana Prince. He curses that she probably cannot even figure out how to answer the damn thing! He then receives a call from his boss and is ordered by Sarge Steel to report to work. Diana asks why the Witch is even here in the first place and is told that she is here “because love and murder are the only things that matter. 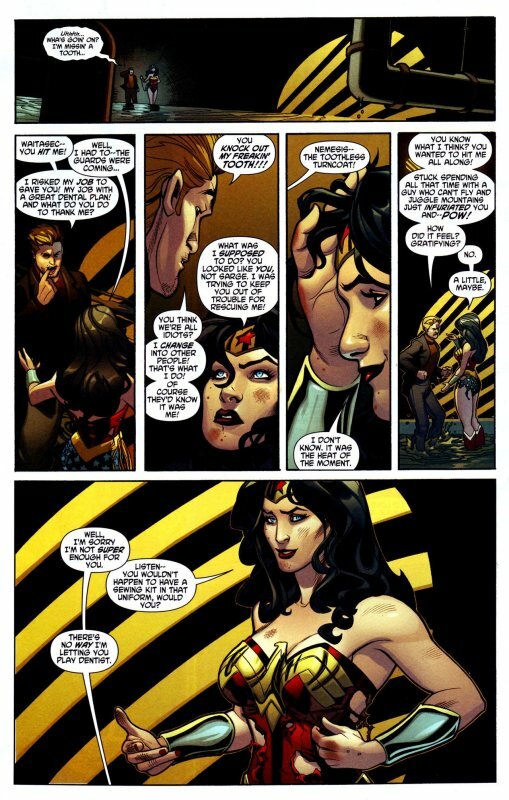 They’re what it means to be human and if that is the case then she will always be more human than Diana.” Wonder Woman replies “Murder doesn’t make you human” and as Circe vanishes again she responds “Tell that to Maxwell Lord…then try telling it to yourself”. Meanwhile Tom, disguised as Sarge Steel, ties up several guards and dumps them in a supply closet before making his way down to the holding cell chamber. He knocks out the unsuspecting guards and approaches the cell. Wonder Woman asks what he wants from her now and adds that he had better be prepared to kill her because she will never reveal anything while there is still a breath left in her body! He warns her to back off and she snaps “Go to hell” but he responds that he means it…literally. He then uses an explosive charge to blow away the wall before revealing himself to be Nemesis. Stepping out of the cell Wonder Woman tells him that she has nothing to say to him either. The last time they had been together Sarge Steel had been patting him on the back for a job well done. She has no reason to trust him now. 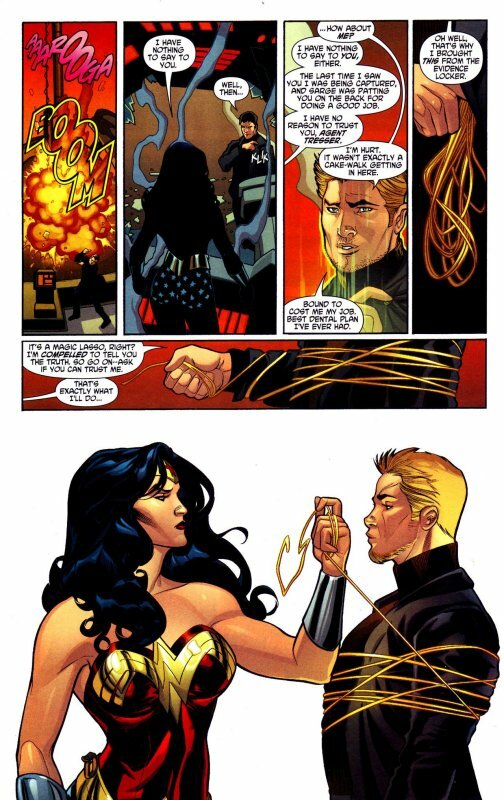 He replies that it ha snot been easy breaking in here and handing Diana one end of her confiscated lasso, he wraps the remainder around himself and ask her to see if he is telling the truth. She does so and is reassured he is genuinely here to help her. Just then however troops burst in having heard the explosion and Wonder Woman instinctively decks Tresser before taking care of them. She then binds Tom in her lasso and dragging him behind her, starts to dig furiously though the wall heading up towards street level. 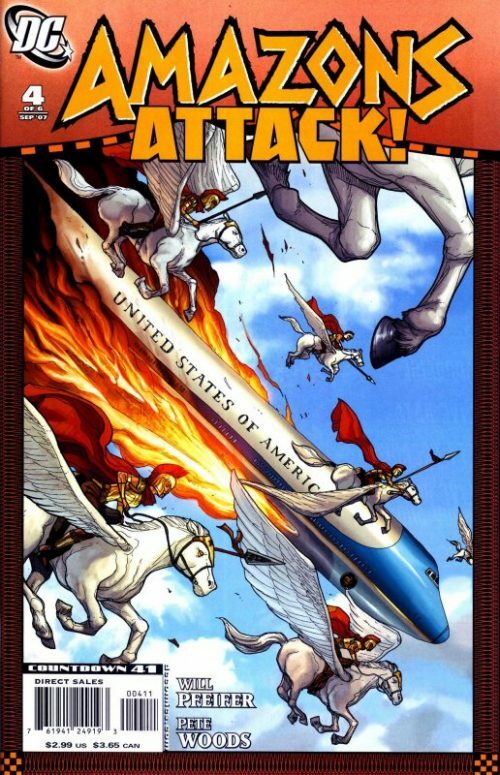 Elsewhere Hippolyta and her Amazon army appears above the skies of Washington and launches their devastating attack on the nation’s Capital! 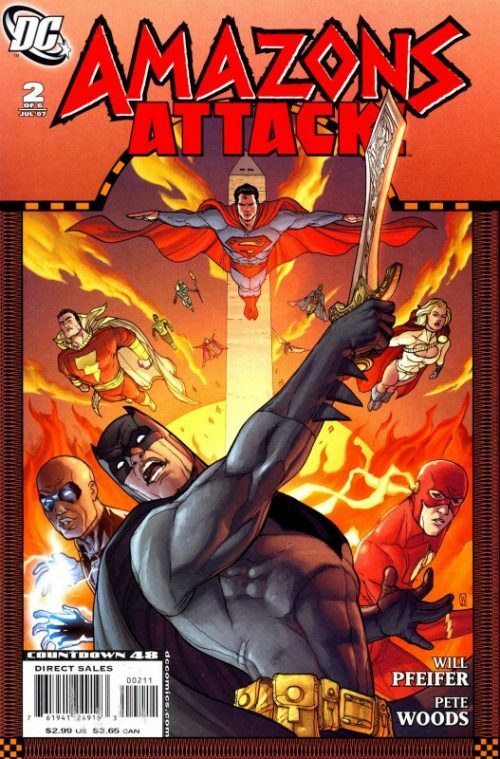 Overwhelmed, the army call for back up as in the monitor room of the Department of Metahuman affairs, Sarge Steel tells Batman that they have a plan of action but that they need the JLA and the other heroes here as soon as possible. 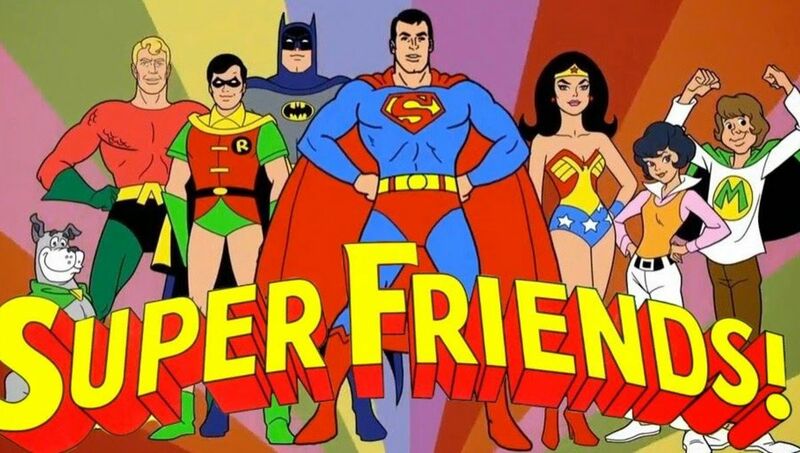 Batman asks where Wonder Woman is and is told they have no idea. The Caped Crusader responds that none of this makes sense, what with the Amazons attacking for no apparent reason and Wonder Woman nowhere to be found. Steel tells him that he too would love to get to the bottom of the mystery but right now, he needs to keep the Amazons from laying waste to Washington D.C. Meanwhile in a waterways under the city’s streets, Wonder Woman and a woozy Tom Tresser are making their way to the nearest exit. He demands to know why Diana had hit him and she replies that she had to as the guards were coming. He had longer been wearing his Sarge Steel disguise and she had simply been trying to keep him out of trouble for rescuing her. He rants that they would have guessed he was responsible for her rescue anyway because he is known as the master of disguise. She smiles as she realises he is making sense and adds that it was perhaps the heat of the moment. He replies that she had simply wanted to hit him all along. “Did it feel gratifying?” he ask her. “Well, maybe a little” she smiles back. She then looks down at her torn costume and asks if he has sewing kit on him by any chance? He opens a compartment on his utility belt and hands her a space-age epoxy, sarcastically adding “I wouldn’t use it if I were you. If it comes into contact with bare skin it causes boils..blisters…chicken pox.”. She snatches the glue and asks him to close his eyes as she attends to the various holes in her bustier. He covers his eyes and smirks that Amazons clearly have a lot to be insecure about aesthetically. She replies that it is no a matter of insecurity but of decency. He sneakily peers through his fingers at her behind and states that what is decent is the birthmark on her behind! She spins round furious and tells him he is a pig. He replies that she coincidentally is a pain in the same place she has her birthmark! Suddenly she launches herself at him and dives for cover as an explosion rocks the tunnel. Ending up laying on top of him she smiles down and says “hello” as he smiles back and says “hi”. She asks if he knows what caused the explosion and he says he has no idea. Picking him up she flies up out of the freshly make hole and into the air. They look across the city in shock as more explosions and fires rage across the capital. Washington is a war zone! Tom asks who on earth could have done this and as they touch down by the ruins of the Lincoln Memorial a stunned Diana sees her Hippolyta standing there smiling back at her.